Until the pain of the same is greater than the pain of change will most people decide to do something to alter their lives. So many people complain or are not happy in their daily life, however they tend to stay stuck and do nothing about it until a crisis occurs. Health, financial or relationship issues are some of the major areas in our lives that tend to become stagnant and worsen if we are not constantly improving them in some way. We do things the same way, day after day. 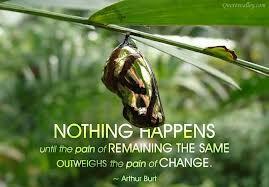 Until the pain of the same becomes greater than the pain of change do we take progressive action. We are either moving forward or falling behind. There is actually is no stagnation, although it appears that things aren’t moving in any direction. Nothing stays still. We live in an ocean of motion. So why not move forward every day and improve your life? Just little steps, that’s all it takes to change and become better then before. We are here to create, to live an abundantly wealthy, rich life, in body, mind and spirit. Today, decide to make a change, and improve your life. Don’t wait until the pain of the same to be greater than the pain of change to live a better life. This entry was posted on Tuesday, February 19th, 2013 at 12:56 pm and is filed under Winner's Image. You can follow any responses to this entry through the RSS 2.0 feed. You can leave a response, or trackback from your own site.